Turn those hard boiled eggs into Spicy Deviled Eggs to enjoy with Easter Dinner or the backyard BBQ! An easy DIY side dish recipe tutorial idea. This is a sponsored post on behalf of Miracle Whip, all opinions expressed are 100% my own. Easter is this weekend! Ahh! Don’t worry I’m not ready yet either. But one thing I am definitely ready for is Deviled Eggs. Yumm-o! With 4 kids, we dye a lot of Easter eggs, and the kids always have a lot of fun. 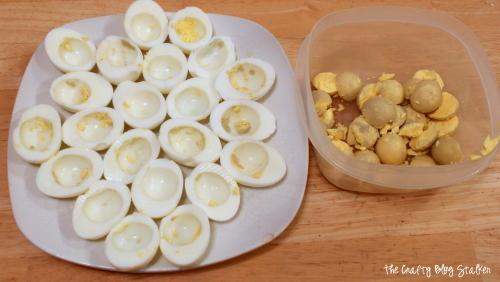 But I look forward to the Deviled Eggs I get to make with all of those eggs! This year I tried a different recipe, Spicy Deviled Eggs. 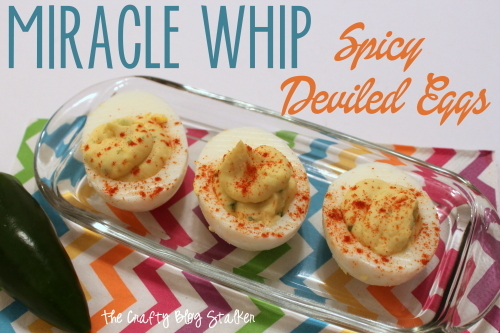 These little babies are so good, with the tanginess of Miracle Whip and the fresh jalapeno peppers it is a spicy twist on the classic deviled eggs. 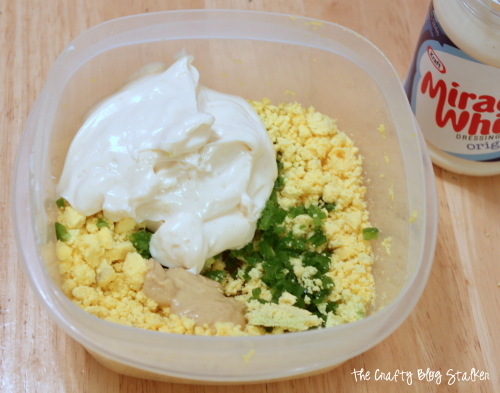 This recipe comes from the Miracle Whip Website and there are lots of other great-looking recipes there so you should definitely check it out! PREP TIME: 15 min. | TOTAL TIME: 15 min. 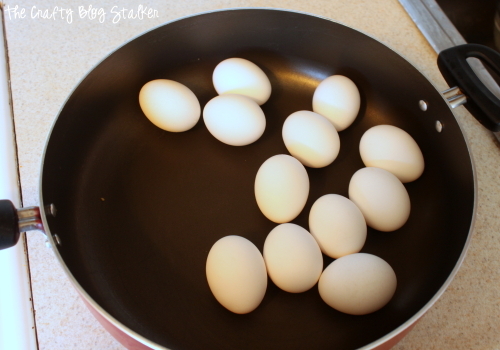 CUT eggs lengthwise in half. Remove yolks; place in medium bowl. Mash with a fork. Sliced additional jalapeno pepper; use to garnish eggs before serving. For starters, you need to hard boil 12 eggs. A tip for the perfect hard-boiled egg is to use a larger saucepan where the eggs can lay single layer. 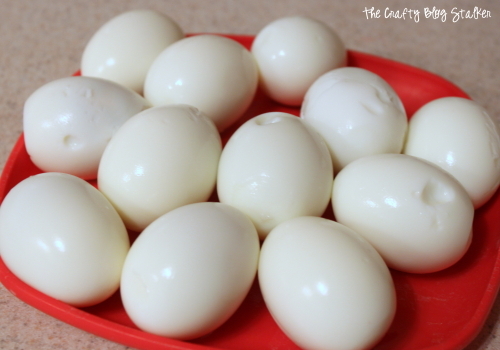 Cover the eggs with about an inch of water. And heat until boiling. 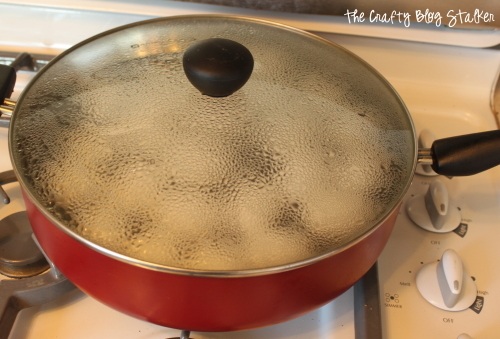 Once boiling is reached, remove the pan from the heat and cover. Let sit for 15 minutes. 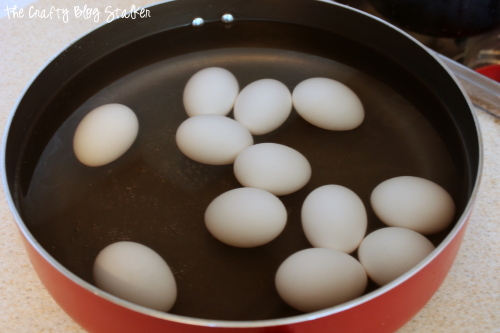 Drain water and put eggs in a bowl of ice water and let sit until completely cool. You may need to change the water. Perfectly hard-cooked eggs will have a firm yellow center with no greenish tinge. Once the eggs are cooled peel the shell off. Slice the egg in half lengthwise, Take out the yolks and put in a medium-sized bowl. Mash the yolks with a fork and add the remaining ingredients. Mix well. 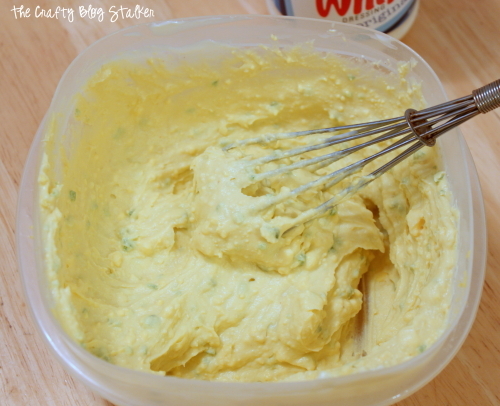 For a very smooth paste use a hand mixer. I am personally ok with the tiny chunks of yolk so I mix it the best I can with a whisk. Here is another brilliant tip. 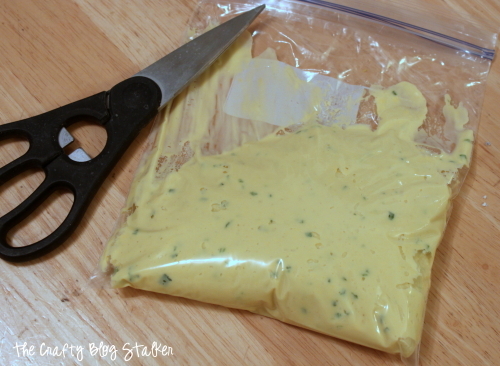 Spoon the mixture into a resealable plastic bag and then cut the corner tip. This will make filling the eggs so easy and won’t be messy at all. Squeeze the bag just enough to get a good dollop of the mixture back inside the egg. As a side note, a serving size is one egg half, so keep that in mind when planning ahead. Here are all 24 egg halves filled and looking delicious. If you would like you can garnish with a sprinkle of paprika. Or some extra spears of the jalapeno pepper. However you serve them up, you, your family and your guests are going to love them! 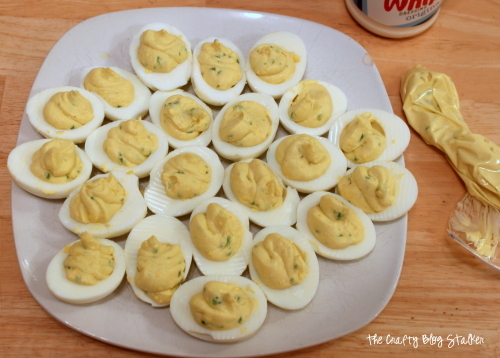 Do you have a favorite Deviled Eggs recipe? Share and leave a comment below! 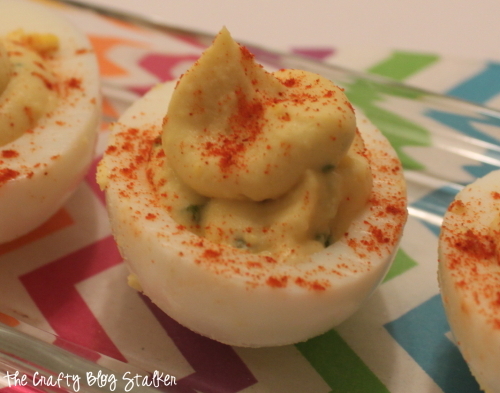 SAVE HOW TO MAKE SPICY DEVILED EGGS TO YOUR FAVORITE RECIPE PINTEREST BOARD! Mmmmm deviled eggs 🙂 I love the spicy you added to them. I would love for you to share this at my Friday T.G.I.F. Linky Party. Have a great weekend!! We love deviled eggs and this sounds like a nice twist. I am growing Jalapenos this year, o I am pinning this for later.